In the year 141 B.C., Ping is an illiterate Chinese orphan who lives on the edge of one of the Emperor’s least-used royal palaces. Her master is a boorish drunk who neglects his duties as Imperial Dragon Keeper. Under his watch, the Emperor’s dragons have dwindled from a magnificent dozen to a miserable two. When the next to last dies, the remaining dragon, Long Danzi, coaxes Ping into helping him flee to the faraway ocean. 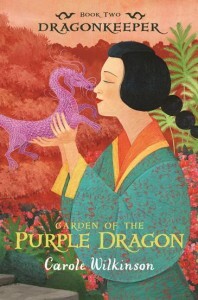 Early on in the journey, Ping knows the dragon and the mysterious purple stone he carries are very special. But how is it that a grubby slave girl has come to be the keeper of the last imperial dragon? Only when the friends reach their destination will Ping be able to see herself as Danzi sees her, and learn to use the unique talents she alone possesses. In ancient China, a young slave girl lives at one of the Emperor’s palaces, looking after the animals and her cruel master. She doesn’t mind most of the animals, but finds the two dragons particularly ungrateful creatures. When one of them dies, she discovers that her master plans to sell the last dragon to a dragon hunter, and she decides to free him, freeing herself in the process. She soon discovers, much to her surprise, that she can understand and speak with the dragon. 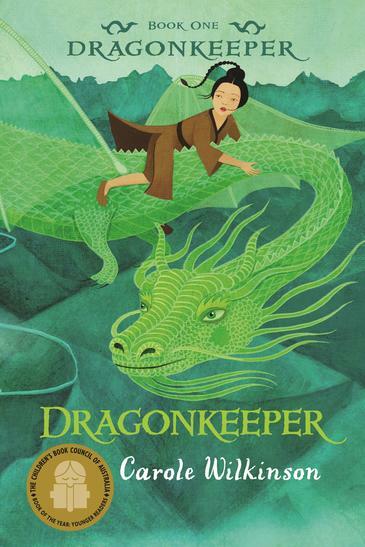 The dragon, Long Danzi, tells the girl that her name is Ping and she must travel with him to the Ocean and look after him and the mysterious dragon stone. On the journey, they encounter many strange obstacles including necromancers, the evil dragon hunter and the Emperor himself. Ping must learn to control the power of Qi if she is to keep herself, Danzi and the dragon stone out of trouble and get them to the Ocean. Dragonkeeper was the winner of the Aurealis Award for best young adult book, and also the Children’s Book Council of Australia Book of the Year in 2004. It’s not hard to see why – this is a tale of a young girl realising her own worth, discovering her powers and beating overwhelming odds. The ancient China of the story is brought to life, not just through the beautiful descriptions of the land and the scenery, but also through the people and creatures who populate it – some cruel and downright evil, others kind and gentle. The story is told in a simple way without over-complicating anything, and even the most serious moments are made lighter by witty comments from Ping or Danzi from time to time. I loved how their relationship developed and was heartbroken at the end – but I’ll be catching up with the next part of the story to find out what happens. 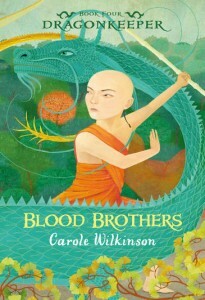 There are some pretty harsh themes in this story – human sacrifice, animal cruelty, using body parts for magic and slavery might all be a bit much for the very young to cope with, but I think that any older middle-grade reader would devour this book. Don’t be put off by its 340-odd pages, the print in my edition was rather large so it was a quick read. Children’s literature should have more dragons in it! 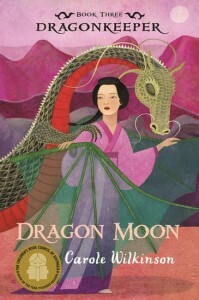 I loved this book, and any other dragon-lover (of any age) should too. Carole was born in England. Her family moved to Australia when she was 12. 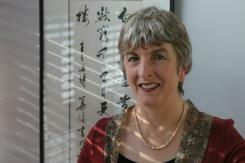 She now lives in Melbourne, with her husband John. Carole didn’t start writing until she was nearly 40. Before that, she worked as a laboratory assistant, working with a lot of blood and brains. Once she’d decided to try and become a writer, she went to university. She wrote a lot while she was there including her first novel. She showed it to a friend who worked in publishing who asked if she could write a teenage novel. Her first published book was based on something her daughter, who was at high school at the time, was doing. Carole says she has lots of ideas and so far she’s never had ‘writers’ block’. She might have got a late start, but she’s been trying to make up for lost time and has written more than 30 books, some short stories, a telemovie and some TV and planetarium scripts. On a more serious note, yey! I’m adding this to the TBR list and hoping that I can find it somewhere in the states! That cover is awesome, first of all. And second, I love dragons! Third, sometimes the best fantasies are MG fantasy, although I can’t say that I have ever read an MG High Fantasy. This one might just be the first one. I love the synopsis! I love the idea behind the book. And I honestly can’t wait to meet Ping! Necromancers, an Emperor, an evil dragon hunter and powers! Sounds like an epic story to me. Thank you for your fantastic review!